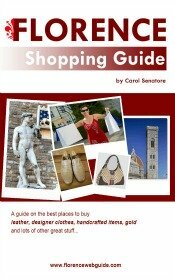 Santa Reparata church was the original cathedral of Florence. 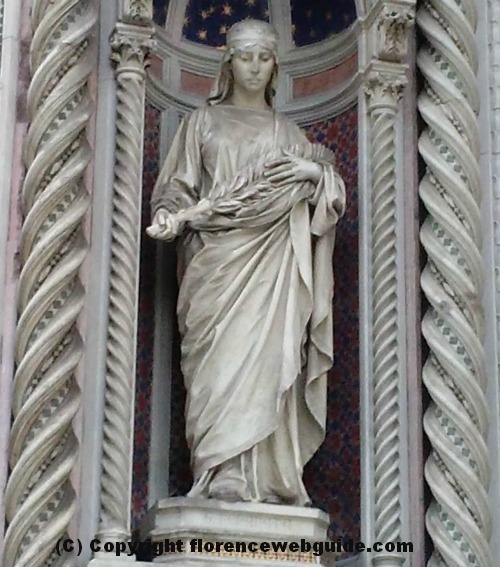 Saint Reparata - a Christian martyr from third century Palestine - was the patron of the city up until the late Middle Ages. 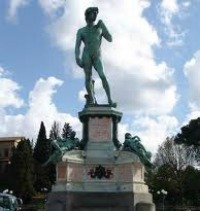 Reparata was chosen as patron because it was on her feast day that the citizens of Florentia were victorious over the Ostrogoth invaders led by Radagaisus (about 400 AC). After this victory a church was built in her honor. 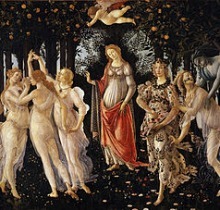 Eventually John the Baptist replaced Reparata as patron of Florence, but today this Christian virgin who died for her faith is still considered co-patron of Firenze. The church in her name was one of the city's first Christian buildings, built some time between the 4th and 6th century. By the 9th century, what was just a church had become the main basilica. In 1296 however work started on a newer, bigger cathedral to be built on top of this modest church which was considered too small for a growing Florence. Luckily, modern day excavations have brought this ancient church back 'to the light'. 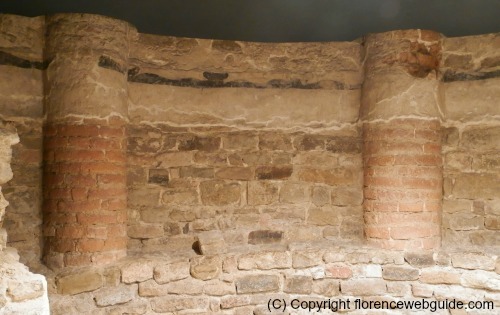 A great thing to do when you are visiting the Florence cathedral is to go downstairs to the archaeological site to see the ruins of Santa Reparata. The church of Santa Reparata was located just where today's Duomo stands. The plan on the left shows you just how much the cathedral was enlarged when the Florence council decided that the city needed a much bigger and more impressive basilica. The pink outline illustrates the original church of Santa Reparata. The sketch in orange shows the first plan for the new cathedral by Arnolfo di Cambio, which was more than double the size. And, the beige outline shows the size of the cathedral today - after di Cambio's plan was enlarged by Francesco Talenti. 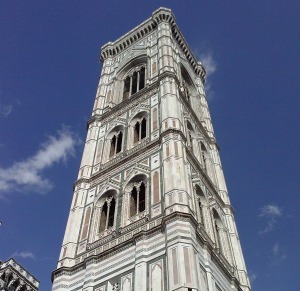 So, as you can see, the Florence cathedral went from small to mammoth when the Saint Reparata church was replaced. 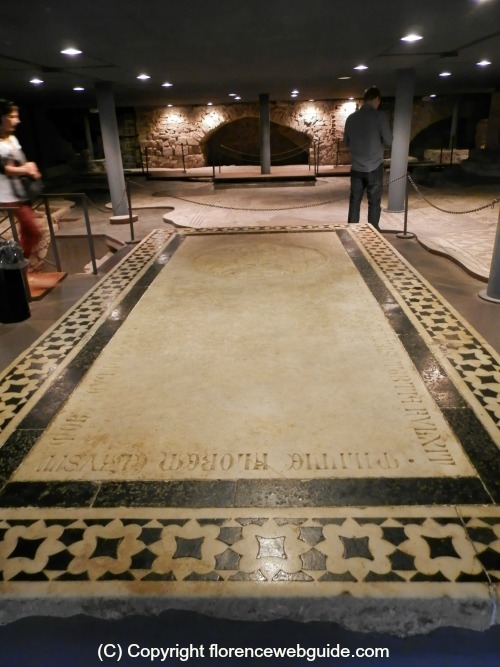 The remains of Santa Reparata are located about 2 meters (7 feet) below the pavement of the Duomo. You go down a staircase inside the cathedral to get to the ancient site which takes you back to Roman life in 4th century Florentia. Excavations go back to the 1960's and 70's when about a third of the area that the church had taken up was unearthed and studied. The ancient basilica is thought to have had 3 naves and a series of 28 pillars aligned in two rows. At the site you can see sections of this original foundation (see pic below). 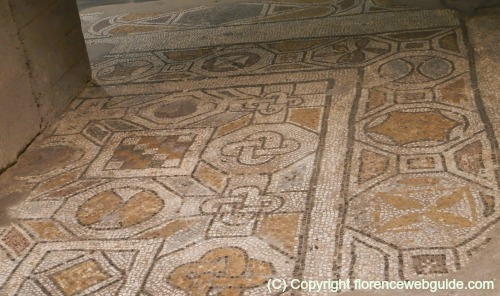 One of the highlights of Santa Reparata is seeing the original mosaic floor which is in surprisingly good shape. Dated between the 4th and 6th century, this incredibly intricate mosaic pavement impresses both for the brightness of its colors and the clarity of its images. The designs are typical of Imperial Rome with geometric shapes, rosettes, lozenges and Latin crosses. 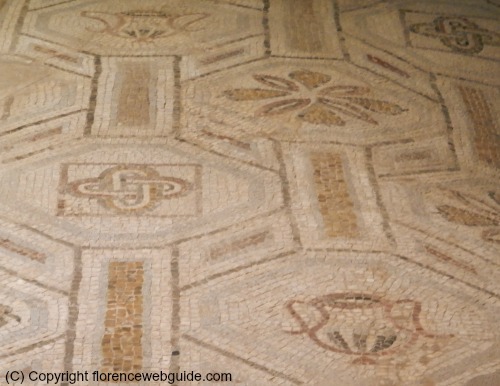 This close up shot below shows floral patterns placed in octagonal 'circles' and - in the lower right and upper left corners - a goblet, a common Christian symbol. 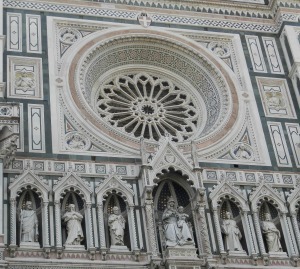 While the new Duomo was being built around the sides of Santa Reparata (from 1296 onwards), the Florentines continued to attend mass at their familiar cathedral, in spite of the construction site. 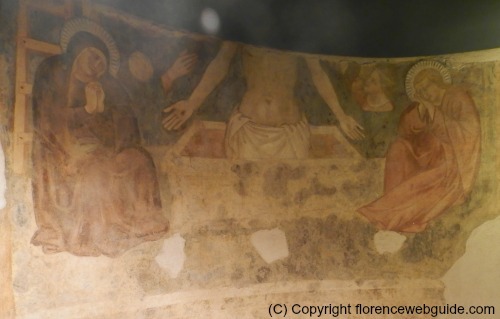 The fresco of a 'Pieta' below goes back to this 'cross-over' period, sometime between 1250-1350. Although a new cathedral was in the making, beautifications were still being carried out on the old church, likely due to the affection people had for their basilica. Once the cathedral of Santa Maria del Fiore was completed, what was left of the 'old' cathedral started to be used as a place for burials. Some 'big names' who were buried there include Popes Stefano IX and Niccolò II, Giovanni de' Medici and - the most important of all - Filippo Brunelleschi. 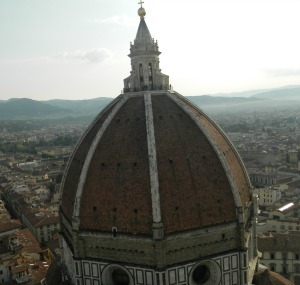 The church's most famous tomb can be seen below, Brunelleschi's crypt, the mind behind the cupola of Firenze. 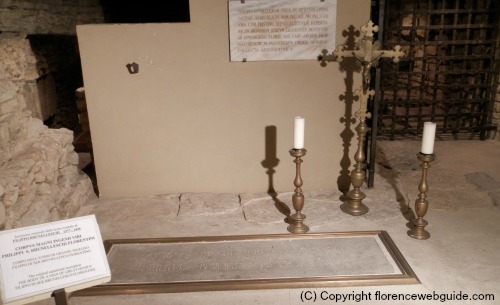 Incredibly, the burial place of one of Florence's most important citizens was only discovered in the 1970's. 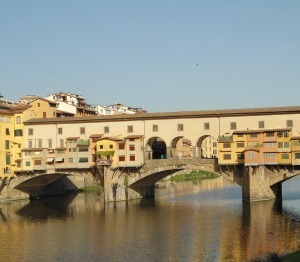 Both the magnificent dome of this church and many other marvels invented by the architect Filippo Brunelleschi bear witness to his unique skill. In tribute to his exceptional talent, a grateful nation that will never forget has buried him here below. 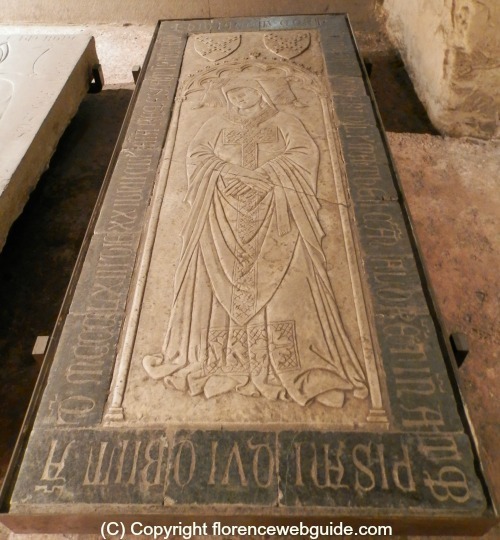 Another elaborate tomb (see pic below) is the resting place of Giovanni de' Medici, gonfaloniere of Florence in the 1300's. 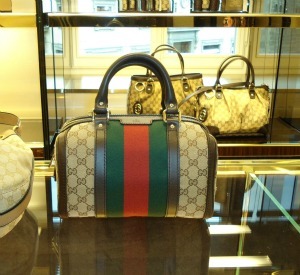 The archaeological site also has several display cases with relics and artifacts found during the excavations. Findings go from Roman coins dated 300-400 AC, to belt buckles, weapons and other such accessories going back to the Medieval period. 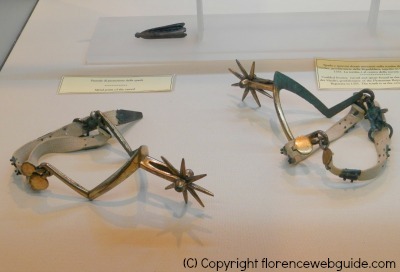 Below see the horse-riding spurs of Giovanni de Medici. Visiting the Duomo is free-of-charge, but as of 2013 there is a 'unique ticket' to see the rest of the entire Duomo complex. 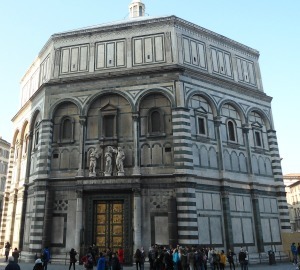 This includes also Santa Reparata (as well as the Baptistery, the Bell Tower, climb up the Cupola, and the Cathedral Museum).